Did you count the divine audience? We have heard Gurudev Sri Sri Ravi Shankar talk about this! Many a shutterbug have even captured them in their picture frames. Some try to explain it as a scientific phenomenon. Some even call it a “blue-star” syndrome. Some more even take the liberty of ignorance to dismiss it as a superstition. Yet the phenomenon of “angels” or divine energies being spotted during various spiritual activities blessed by Sri Sri continues to intrigue those who seek to know the real truth about this creation. 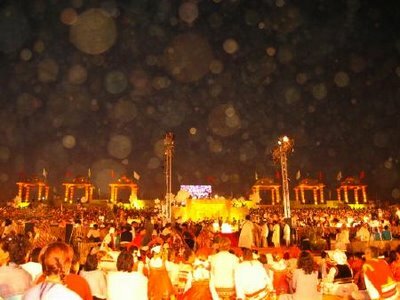 It is impossible to dismiss this intriguing phenomenon of angels, after finding out what a Nadi Expert decoded just after this year’s Navratri celebrations at the Art of Living Ashram in Bangalore. Naadi is an ancient science that decodes the past, present and future of an individual as foreseen by sages in ancient time and recorded in palm leaves. Today, there are very few experts who have the knowledge to decode the Naadi inscriptions. I wish modern science could testify this 7000 year old Akashic records and corroborate the revelation of the Devas, Devis and Sages assembled at the Art of Living Ashram in Bangalore for 2012 Navratri celebrations! 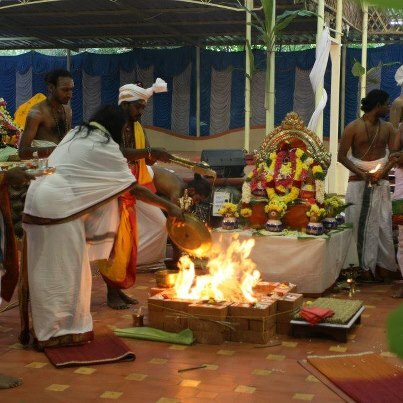 After the Maha Shata Chandi Homa, a Naadi Expert from Tamil Nadu checked the palm leaves and decoded the following conversation between Kaushik Muni and one of his disciples. Kaushik Muni: We go everywhere, but here the yagnas have been done for the entire humanity without any selfish motive and without any deceit in the heart. The poojas here have been done for the benefit of whole world. That is why we come here. Kaushik Muni: But we were welcomed nicely and taken very good care of. Also, here the pundits don’t do the yagnas as a profession, but with a pure heart. The fruits of yagna have reached even those who are not present here physically but have remembered Gurudev, They have all been blessed. Many calamities have been averted; the hearts of people with violent and negative tendencies have been transformed. Lovely! Of course even the divine angels and subtle beings crave to be in the company of our beloved Gurudev, who is the Lord of this entire creation! The small intellect explodes into infinity even by thinking about the phenomena happening around Him! JGD! When you use terms like ‘liberty of ignorance’ you are essentially saying those who disagree are ignorant. Please respect everyone’s opinion like you expect them to. Practice acceptance, don’t call names and sling mud merely cos someone doesn’t agree with your opinion. ignorante, le llaman a aquellos que no pueden ver mas allá de sus narices, que no pueden ver mas allá de sus cuerpos físicos por el velo (mente) que tapa su tercero ojo o chacra de de la percepción extrasensorial. Nada ofensivo si entendemos que se usa para señalar a aquellos que aún no pueden ver mas allá de la tercera dimensión. It is said that what we know of the Universe is only one per cent of what is. It is amazing how the ancient seers had refined their consciousness to capture the unseen and share it with us. Thank you for sharing this with us. Wow ! lucky ones are those who witness this every year…..
What the author here is attempting is to explain an interpretation from Nadi Shaastra ( which is different and distinct from Nadi Pariksha ). The way this works is, a question is asked to the Nadi Shastra “expert’ who then refers the nadi records to find a reference and interpret it as per present scenario. The author above im assuming is sharing with us the interpretation of the same and not necessarily the actual records. Wow! After reading this, I am glad I never miss Navaratri or Shivaratri.. Come what may we should be there for at least these two Maha Yagyas with Poojya Gurudev. Please clarify the following points to help the readers better understand the same. – If this is 7000 year old record then how can “the disciple” be astonished by “seeing” ( in the present age and time) all the celestial devas and devis in AOL Ashram ? 2) Is AOL ashram mentioned in the 7000 year old record ? Can you show us evidence ? 3) Why is that the answers as seem to be quoted from Kaushik Muni seem to speak on behalf of the Devas, Devis ? 4) Do the 7000 year old records that seem to be quoting Kaushik Muni specifically talk of Guruji as mentioned in the below paragraph from the article ? By quoting Guruji and AOL Asharam as seeming to have been stated in 7000 year old records is something difficult to agree with. I too believe, possibly this is a handy work of an over-enthusiastic devotee. I too don’t know, but on the sincerity of Gurudev’s works and reach to the masses, I too am a witness. There is a calmness and assurance in his presence. Let that be so. Ages ago, some say 7000 – others say 10,000 – years ago, Agastya, Kaushika and some other similar Munis (Sages) wrote about the future events, many in cryptic transcriptions, in present tense, and they are recorded in palm leaves. (Or, it is also told that since the universal events are cyclical repetitions as per Indian belief systems, it may be an event what had happened in the past, which is bound to repeat). The system is, when we go to them for reading our future, with some signals from us such as our name, star, etc. they will select one of the palm leaves and then read it out which will depict our future in present tense, as if it had already happened in the past to someone of similar background or feature (may be our alter-ego in the past). I have no personal experience, but some of the things my brother-in-law narrated at that time – 18 years ago – and some of the events subsequently happened in his life had an undeniable link, to which I am privy. Mysterious are the natures ways!! It is beyond words to explain how one feels during Navaratri Yajnas in Bangalore Art Of Living Ashram. Reason being explained very well in the article. We are so lucky and blessed to part of it. I was a first timer this year. The experience was indescribable. How fortunate was i and all others to be a part of it. JaiGuruDev! I heard that d divine himself saught fr this naadi likhani fr him…divine is fr devotee n belongs to us…cant we know what is written there fr him….??? we have never missed navaratri poojas for last 8 years in ashram, but this year poojiya gurudev given us pooja to happen in our town, tirupur, tamilnadu. We are blessed n blissed with his grace, n the divine. Though v cudnot be in the physical presence of poojiya Gurudev, enjoyed lot with swami Gnanatejji. Yes.. and could feel the unparalleled energy, and bliss, while sitting for the pooja’s this time at the ashram. Especially more, during the final Chandi homa; and the Rishi homa – where all these rishi’s and sages where one-by-one invited and felicitated in the 3hour pooja. No Words.. 🙂 Lucky to be connected to Guruji. Guruji, Wish to meet U soon. wow, wonderful. And I truly believe in it. The thrilling yet so soothing atmosphere is prevailing there in the Ashram all the time. And Navaratri is even so Divine actually no words….. We better experience this ourselves before we comment on this for which we will regret later. Guruji, you are the Divine presence on this panet right this moment. Very previlegded to part of this Art of Living movement, Jai Gurudev! I visited the Banglore Ashram last week, where I attended the Navratri Homas and did the Gurupuja course also. The moment you enter the Ashram, there is sudden shift in your mood. I could see large gathering of people from all corners of the world. To anyone’s surprise, the huge crowd of about one lakh people was moving without any chaos and confusion. Everything was happening effortlessly, systematically. The whole place was very clean, in spite of a large gathering. Everybody had an expression of peace and contentment –cleanliness both from the outside and the inside. Simultaneously, various courses were happening in several halls. It may have been an advance course of meditation, teachers’ meetings, Vedic classes, blessing courses etc. In the midst of it all, one could not hear any unpleasant noises. Even in various shops where there were very long queues for the payment of bills, I could not hear any impatient remarks. Even during long hours of pooja, I could see that nobody was talking, but everyone was meditating peacefully. Evening satsangs were very unique. Everybody is full of a great enthusiasm. Here I could see people from all backgrounds, from an average person to people holding the highest posts. The moment Gurudev enters one could see a sudden wave of high energy flowing through everybody. Every third person was in tears, tears of gratitude towards Gurudev. They might have been from any nationality, but there was no difference in their devotion.It is like having a mother caring for all her children. I have never come across such unique atmosphere where everyone is in high spirits, yet so peaceful. About six thousand internationals were attending the various courses. One could see a live demonstration of the expansion of one’s consciousness – everyone becomes like a child in the presence of Gurudev’s typical affectionate and innocent smile. I can safely say this is divinity personified. After practising medicine for almost 30 years I was bound to think about the necessity of meditation in today’s world – how beautifully one can cross through all the hassles of life. we are really blessed to be with our master and in such important yagnas and functions.. i would like to share an event , recently feb20 2013 happened to be my close friends house warming ceremony.. it was done with full vedic rights vastu, navagraha ganapathi satyanarayana puja and rudrabhisheka, gurupuja.. I was really astonished many such angels were seen in the photos during and after puja in fact i cud see huge one on my head and where ever i was there also many all over the house.. I was astonished and my friend is a devotee of guruji he felt blessed by guruji and i am an art of living teacher… just sharing this with you.. not many will understand why such objects are in the picture..
all blind and dead people . Some peo­ple are say­ing ART OF LIVING is Heaven in the Earth.It is really heaven because all the dead peo­ple go there with­out soul.They leave their fam­i­lies, friends even their career.They all work for a Man called Ravi Shankar like slaves.This is my hum­ble request do not send your chil­dren in AOL because I lost my elder daugh­ter there. This thing abt angel was real crap…this man considers himself god and wants ppl to call him god….this is effect of reflecting DUST PARTICLES and not angels you dumbasses ! !